Andrea Waltz (@GoforNo) is passionate about helping people reprogram the way they think and feel about failure and rejection to achieve their goals. 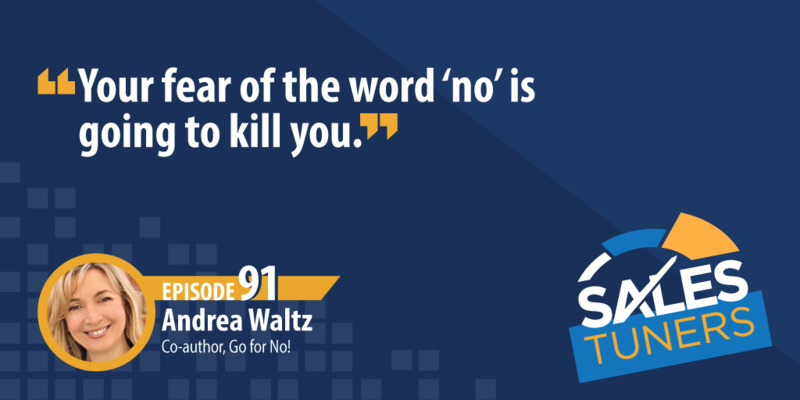 As the founder of Courage Crafters, Inc, a keynote speaker on overcoming rejection, and the Co-Author of the best-seller, “Go for No!”, Andrea doesn’t let “no” stop her from anything. She believes sales is a fantastic career, and in her opinion, salespeople miss a lot of opportunities to hear “yes” due to fear of failure. Instead of striving for perfection, look at the activity generated and the lessons learned from the perceived failure. The “no” often comes in other forms such as ‘let me get back to you’ or ‘send me some more information.’ So when you hear “no,” the best thing to do is identify the next question or statement to make as a way to gain more context. By valuing “no” you spend your time more wisely, clean up your pipeline, and generate the right activity. After all, you never get anything in life if you don’t ask it. Increase Your Failure Rate: If you’re the person being rejected or constantly being told “no,” it may be hard to hear that you need to increase the amount of times you should actually hear it. But, the real question for you is what opportunities are you leaving on the table simply by not asking the question? What deals could you have kept alive if you had just asked the question? What other products could you have bundled in the sale if you had just asked the question? What referrals could you have got if you had just asked the question? Stay Curious: After you’ve heard “no,” what is the next best question you can ask? If you can start to plan your conversations to elicit “no” responses, you can then also start to plan for a strategic follow-up question. Think about what is actually being said when you hear “no.” What additional context can you gain by building upon their response? Practice in Everyday Life: I mentioned in the conversation, my #1 mantra is that you’ll never get anything in life you don’t ask for, so start asking. That applies not only to sales, but everyday things like shopping, dining, travel accommodations, personal relationships, and even dating. If you ask and get a “no” you haven’t really lost anything because you never had it to begin with. But if you ask and get a “yes” you gained 100% of whatever the ask was. To me, this is really a no lose situation.